1. A black fabric tree decorated with fabric paint and a pom pom topper puts a modern Scandinavian twist on the traditional Christmas tree. DIY Christmas tree from vtwonen – instructions here. Styled by Kim Rossberg for vtwonen. Photography by Sjoerd Eickmans. 2. 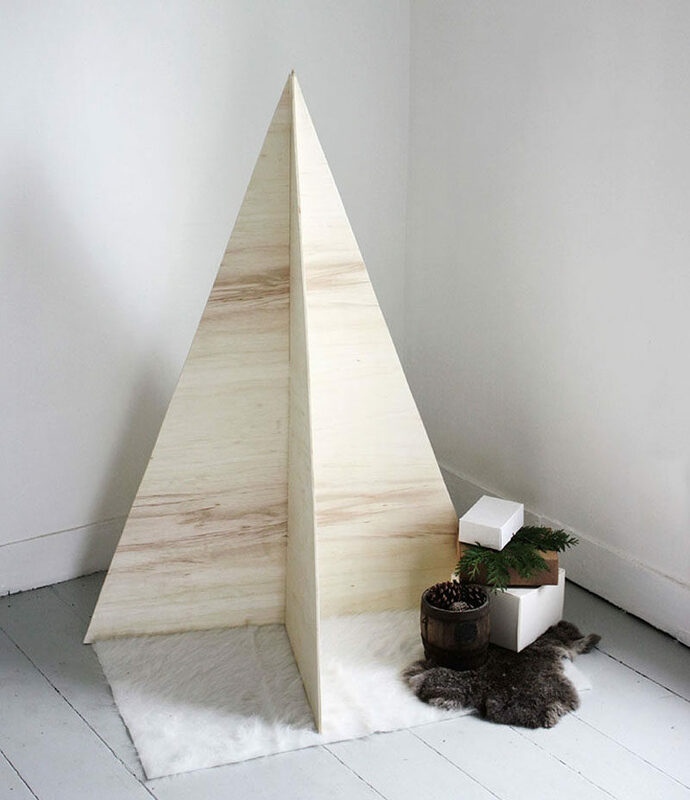 This Christmas tree alternative is perfect for all the minimalists out there. Simple greenery arranged in the shape of a tree can be made as large or as small as you want it. 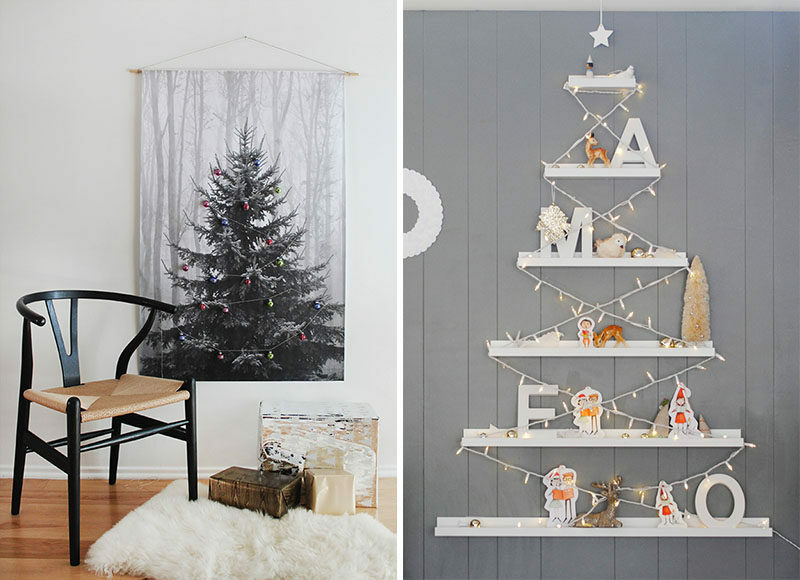 DIY Xmas Tree Wall Hanging from Almost Makes Perfect – instructions here. 3. Build this simple wood frame Christmas tree using scrap wood. Fill the inside with as much or as little wood as you like, and decorate it with some string lights and simple ornaments to make it extra festive. 4. Paint stir sticks have been painted and suspended from a steamer rack to create a floating Christmas tree alternative that has plenty of room underneath it, which is perfect for stacking up the presents. 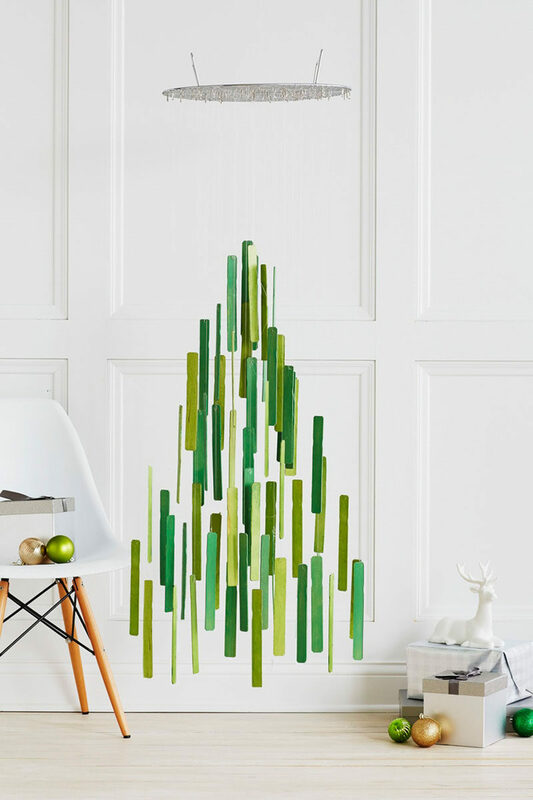 DIY Paint Stirrer Tree by Confetti Pop for Curbly – instructions here. Photography by Michael Haug. 5. Simple trees made from strips of washi tape are an easy way to create Christmas tree shapes on your walls that can be as simple or as elaborate as you like. 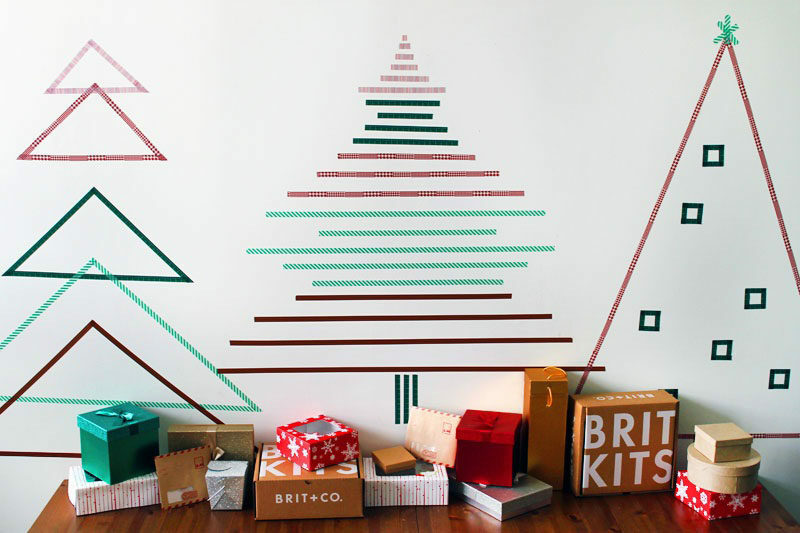 DIY washi tape trees from Brit + Co. – instructions here. 6. This geometric paint chip Christmas tree is a fun way to make a customized tree that perfectly matches the rest of your interior. 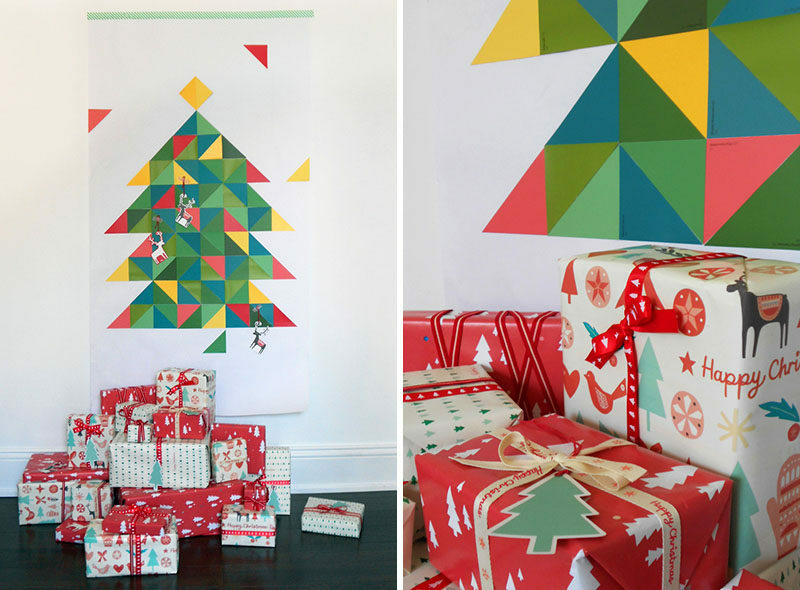 Geometric Paint Chip Christmas Tree by We Are Scout – instructions here. 7. 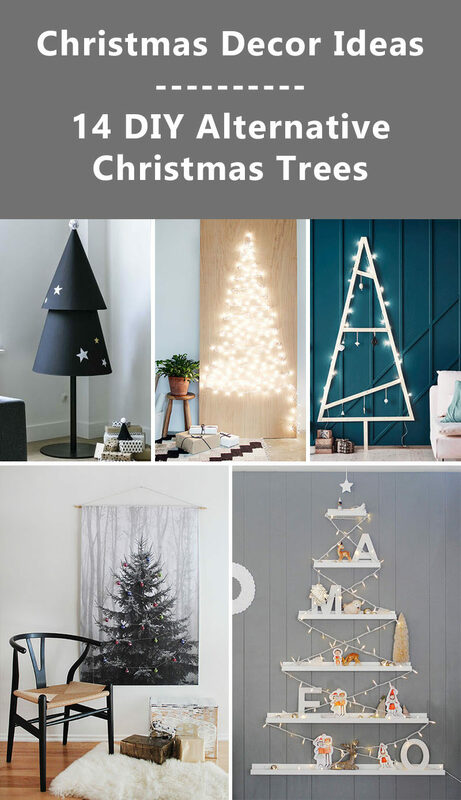 Thin slices of PVC pipe have been attached to a sheet of plywood and filled with fun ornaments to create a festive Christmas tree alternative that can be used year after year. 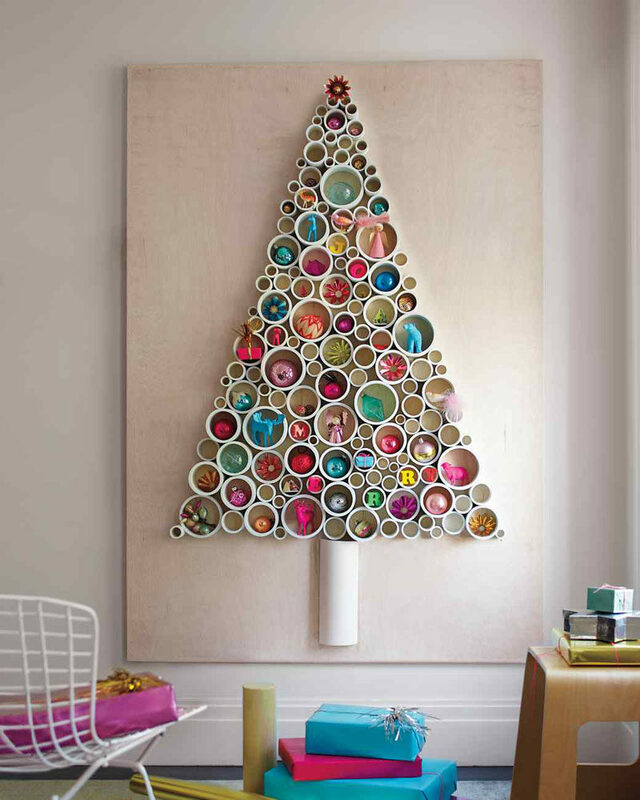 PVC Pipe Tree by Martha Stewart – instructions here. Photography by Eric Piasecki Photography. 8. 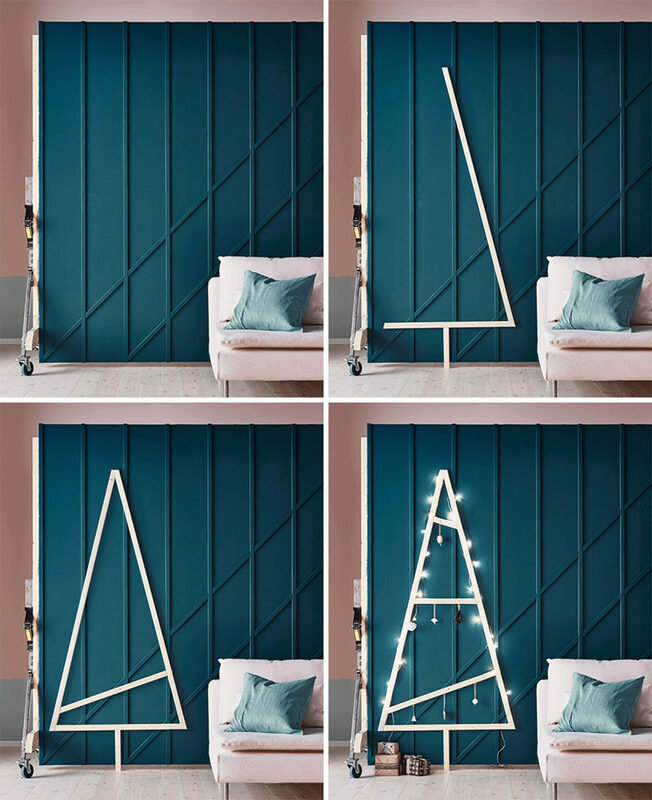 This Christmas tree alternative might be simple but it certainly makes a statement when the strings of lights are plugged in and the “tree” is all lit up. Christmas light tree from A Pair and A Spare – instructions here. 9 and 10. Creating a Christmas tree alternative can be as simple as printing out a large photo of one and decorating it with small ornaments or hanging picture ledges and filling with your favorite family photos. 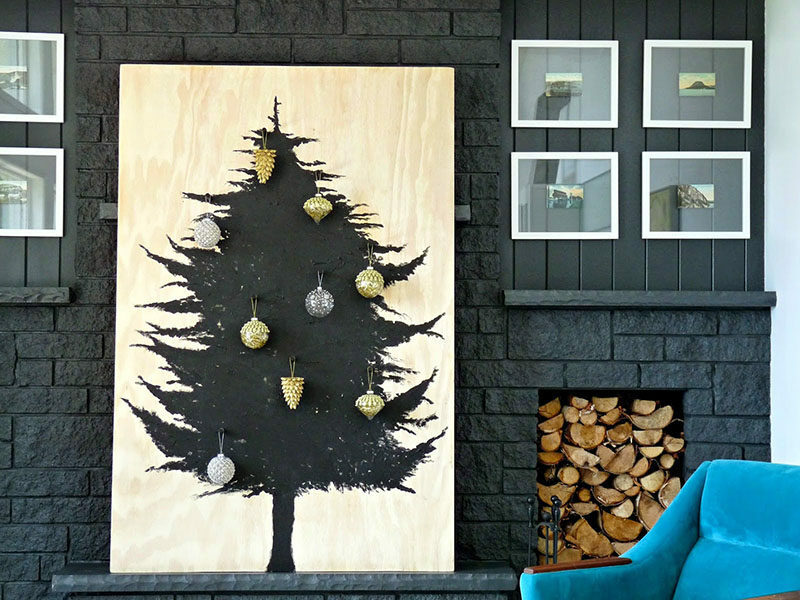 Left Photo – DIY hanging tree print from Almost Makes Perfect – instructions here. 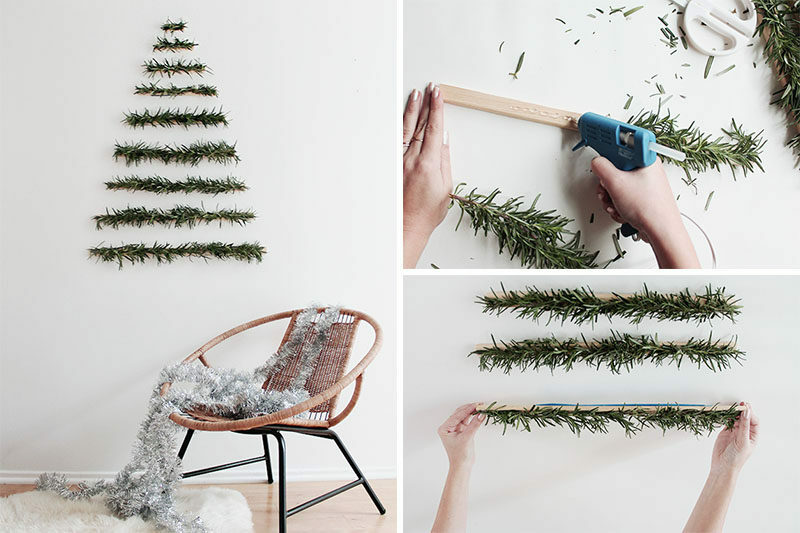 Right Photo – DIY Picture Ledge Tree by MerMag – instructions here. 11. Another alternative perfect for minimalists, this tree requires nothing more than two sheets of plywood and a saw. DIY plywood tree from The Merrythought – instructions here. 12. 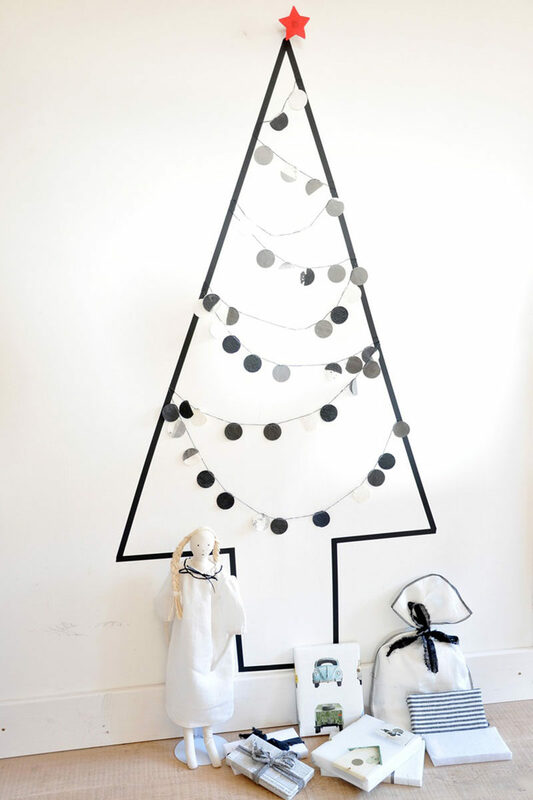 This all black washi tape tree creates a minimal Christmas display that can be decorated or left empty, and makes a spot perfect for piling up presents. Washi Tape Tree from All Washi Tape – instructions here. 13. 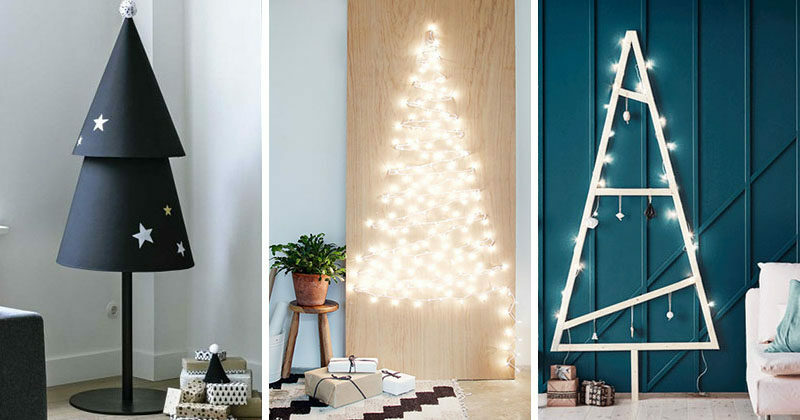 This Scandinavian inspired DIY Christmas tree is pretty easy to make and creates a dramatic look. Scandinavian inspired plywood tree by Dans Le Lakehouse – instructions here. 14. 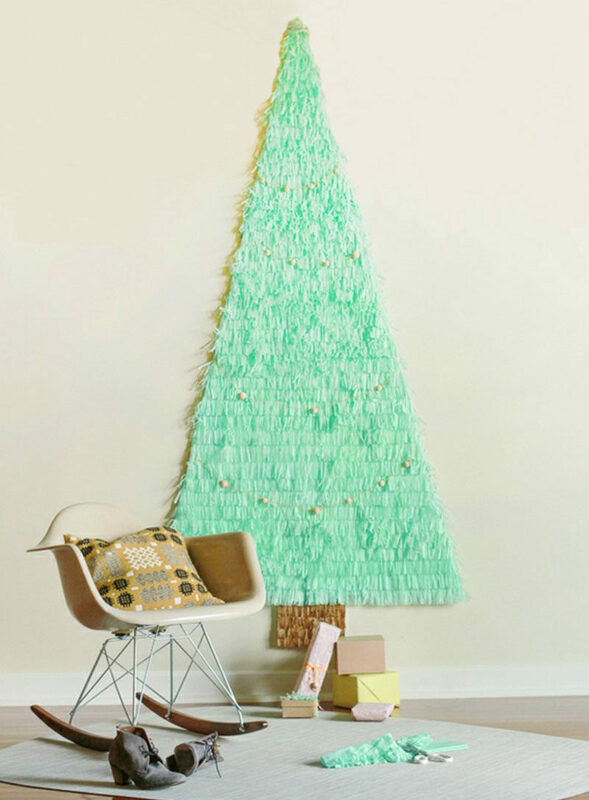 All you need to make this simple space saving tree is some tissue paper, poster board, tape and scissors. 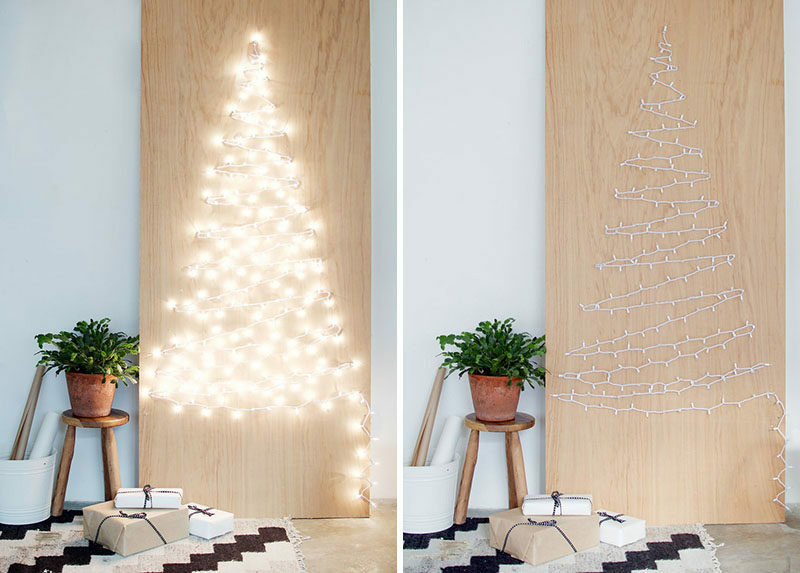 DIY Space Saving Christmas Tree by Brittni Mehlhoff for Curbly – instructions here. Photography by Brittni Mehlhoff.